Cars.com found that 32 percent of car shoppers who were thinking of buying a new car are now looking for a more affordable used car as a result of the economy. None of this is that surprising as people are downsizing their expenses. What is interesting is how OEMs are moving their focus to pre-owned certified program promotion. 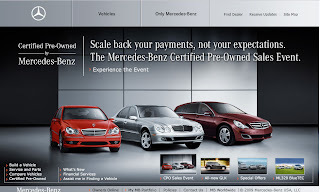 Mercedes-Benz USA leads its website with a message about their certified program and Lexus has increased their CRM email communications about their 2.9% special financing deal for CPO vehicles. Lexus developed campaign on CPO called 60 to 0 that urges buyers, "60 Days to Make a Smart Decision." Of course, the site features a countdown clock in case you are curious how long you have to avoid stupidity.